At first glance, you might think gerbils and hamsters look about the same. Although similarities abound between these two adorable types of rodents, a closer look reveals some differences. For reasons that range from a gerbil's long tail to a hamster's sleeping habits, these two cuties aren't carbon copies. The biggest difference between a hamster and a gerbil is the tail. Your gerbil pal's tail is about 4 inches long -- as long as the rest of his body. Although his tail is long like a mouse's or a rat's, it's furry, not hairless. It'll also have a little tuft at the tip. A hamster's tail is short and stubby. The Chinese hamster has a little bit longer tail, but none of the hamster varieties' tails match the long, fuzzy number on a gerbil. Hamsters come in several varieties and varying size. The Syrian is the biggest, about 6 inches long. Dwarfs are only 2 to 4 inches long depending on the breed. All pet gerbils are Mongolian gerbils, and they're all the same size. He'll have a body that's about 4 inches long, with a tail that's equally long. He's more similar in size to a dwarf breed of hamster than to a large Syrian hamster. Their faces are both undeniably cute, but not identical. A gerbil's face and body are leaner. His face is longer than a hamster's, making him more resemble a rat or mouse. A hamster's face is rounder and wider. His snout isn't as long, giving him his trademark chubby cheeks. A hamster also has the tendency to be a round little ball of fluff, while a gerbil is more streamlined. Both hamsters and gerbils will get up on their hind legs. A gerbil's hind legs are more powerful than a hamster's. He has larger feet and longer legs that make him an excellent jumper. Your hamster won't be hopping around, but he can sit up on his hind legs, especially when he's gnawing away on his favorite chew toy. Hamsters and gerbils keep different hours. 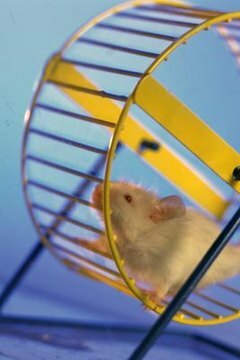 A hamster is more likely to keep you awake by running on his wheel all night. This is because hamsters are nocturnal; they sleep the day away and become active at night. A gerbil is active during the daytime and sleeps at night. This makes it easier to keep a gerbil cage in your bedroom or your child's room without the pet keeping you up at night.